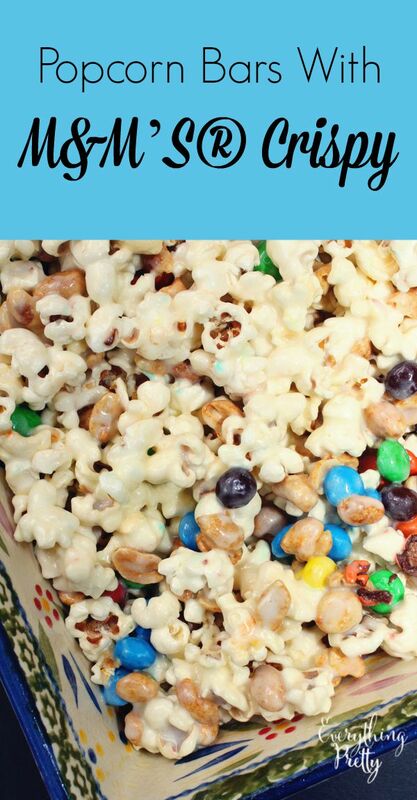 Home » recipe » Popcorn bars with M&M’S® Crispy - A delicious snack under 200 calories! Popcorn bars with M&M’S® Crispy - A delicious snack under 200 calories! Do y'all remember M&M’S® Crispy? They looked like regular M&M’S®, but they had a crispy rice center. If you don't remember them, please don't tell me because this means that either you are too young and that I am getting old or that you do not understand living 10 long years on this planet without these little bites of heaven. Tears may have been shed when I found out that these were no longer on the shelf. I was pregnant all but 6 weeks of 2005, so I may have been a little hormonal anyway. It's all good now because they are back! I celebrated their return by making these popcorn bars with M&M’S® Crispy, peanuts, and popcorn. I've been making healthy choices lately, but I still crave chocolate and sweet treats. That's why I love M&M’S® Crispy because they have fewer calories than other kinds of chocolate with 180 calories per singles pack. I like to keep my snack choices under 200 calories and limit them to once or twice a week. When made as directed, these popcorn balls have just 189 calories per serving. I wasn't the only one who missed M&M’S® Crispy; between calls to their customer service and social media messages, these were the most requested variety to bring back from 2005 to 2014! Thankfully they listened to our cries and reintroduced them in January 2015. In a large nonstick pan, melt butter over low heat. Add corn syrup and marshmallows. Stir frequently until smooth, about 3-4 minutes. Remove from heat. Add popcorn and stir well. Add peanuts and M&M’S® Crispy. Spread into a greased 9x13 pan. Let cool to room temperate and cut in to 24 bars. Each bar has 189 calories, 11 g fat (4 g saturated fat), 97 mg sodium, 2 g protein, 5 mg cholesterol, 23 g carbohydrate, and 1 g fiber. How excited are you that M&M’S® Crispy are back? You can find nutritional information at http://www.mms.com or learn more about them on Facebook.